Ants Are Taking Over My House…HELP! 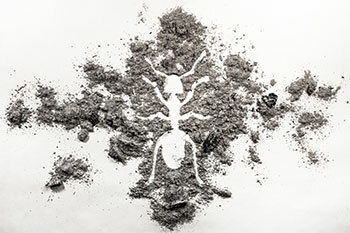 Are you dealing with an ant infestation that just won’t seem to quit? You’ve likely tried a number of DIY ant removal methods on your own, but can’t seem to get rid of these annoying pests. Thankfully the team at EcoTech is only a phone call away. We’ve helped local residents get rid of their ant problems once and for all for years and we’d be happy to come out to your home to provide a free consultation. What is Causing My Ant Infestation? Improperly stored food – Like almost all pests, ants are constantly on the lookout for food. If you’re routinely leaving food out, once one ant comes across it, they’ll head back to their nest and alert all their friends that a buffet’s available on your countertop! Try to store food in airtight containers and keep them in the fridge, or tucked away in cabinets. Trim shrubs and plants from around your home – If you have bushes or plants that have grown up against the exterior walls of your home, this can lead to ant infestations as well. These plants can act as a bridge and transport ants into your home. Keep your shrubs trimmed away from your home to make it harder for ants to make their way into your home. You aren’t keeping your kitchen clean – Once work is done for the day and the kids are down for the night, looking at a dirty kitchen can be a bit overwhelming. You may think that the dishes and leftover food can wait until the morning, but putting off kitchen cleanup is a bad idea. Ants are attracted to dirty dishes and leftover food, so it’s best to wipe down your counters and clean up any dirty dishes daily. Your home isn’t completely sealed – Ants are obviously very small and can make their way into very small spaces. Take note of any gaps around doors, windows and plumbing pipes to see if you can fill these holes to cut down on pest problems of all types. If you’re tired of trying to take care of your ant problem on your own, feel free to give the team at EcoTech a call today. We can be reached by phone at (763) 785-1414 and would be happy to come out to your home to handle all your pest control needs.